2019 is here, bringing its eternal resolutions. 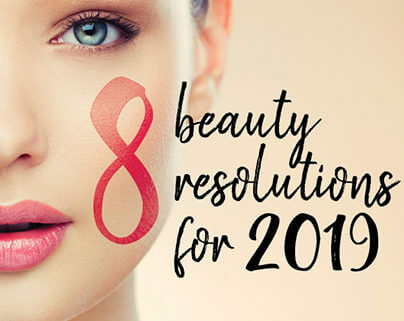 So here are our beauty tips to start the year healthy glowing. At night, when you think everything comes to a stop, it’s actually quite the contrary for your skin. It is while you sleep that many processes work to rejuvenate your skin. Targeted night care products are specifically formulated to revive all the potential of the skin’s natural defences. Blue light coming from electronic devices is harmful to the skin. Its free radicals make skin duller, more fragile and prone to premature ageing. Protect your skin from it by integrating specific anti-pollution care into your routine. Cleaning your face and removing make-up with a special product is the first step to beautiful skin. It removes impurities and pollutants on the surface of the skin that put it at risk of irritation and speed up the creation of fine lines. Eyebrows bring character to the face. We know it, but we don’t necessarily bother when putting on make-up. A tweezer, an eyebrow pencil or shadow are essential to give yourself a whole new look. The scalp is the first to benefit from this trend. Aside from shampoo and conditioner, choose moisturizing oils with which you can massage and treat your hair to make it as shiny as ever. Exercising leads to a myriad of benefits for you health and your skin. Increased blood circulation delivers oxygen and nutrients to the cells, replenishing them with all they need to stay healthy and strong. You have to know that all make-up or care products do not have an infinite life span. You can throw away the ones that are outdated and the ones that were opened more than 6 months ago and also give away what you do not wish to use.